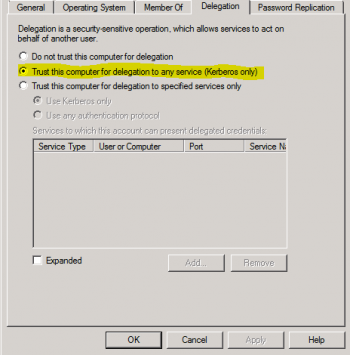 Delegation will need to be configured if XLCubedWeb is installed on a different server to the underlying database and the Website is configured to use Windows Authentication. If you have this type of setup and Delegation isn't configured then you will receive a message such as "Server is unavailable" for Analysis Services or a "(null) user" error for SQL Server when trying to access published reports. Most corporations have a standard setup for Delegation and this would be handled by the Domain Administrators. The following is a guide to how to configure Delegation in the simplest case but is no means a "Best practice" guide as each domain setup and infrastructure can vary enormously. There are also many other factors that can impact a successful implementation Delegation, such as network infrastructure, client security settings and software. The following guide will assume that all the clients will be running Internet Explorer and there is only one domain with everything located on the same physical network with no firewalls/routers that could filter Delegation requests. Ensure the XLCubed Website Application pool is running as either NetworkService or a specifically created domain user and then only "Windows Authentication" and "ASP.net Impersonation" are enabled in the Authentication settings of the website. This is a domain level setting and is set using the "Active Directory Users and Computers" administrative tool which is part of the Microsoft Admin Tools Pack and would normally be on the Domain Controller. If there is more then one domain controller then you would need to either initiate a propagate or wait for this change to be applied to all the domain controllers. The Service Princial Names (SPNs) are set using a Command Line tool: setspn. This needs to be run in an Administrator Command Prompt with an account that has Domain Admin privileges. It needs to be run for BOTH the server name and the Fully Qualified Domain Name. If there is more than one domain controller then you would need to wait for this change to propagate to all the servers. Note that we are using the -S switch, which is available from Windows Server 2008 (see this article for details). If you are using a previous version, use the -A switch after manually checking for duplicate SPNs defined in the domain. In the case where the server has been set up with an alias, if the alias is an ANAME alias, you should add the SPNs for the name that the users will type in. If it is a CNAME alias, then you must also add the SPNs for the machine name, as the browser may use those when requesting the Kerberos ticket. Now the SPNs have been set you would need to enable delegation for the service account and application pool users, this is again done in "Active Directory Users and Computers" administrative tool. After making the following changes and running the Delegation configuration run an IISReset before testing and restart Internet Explorer on the client machine. 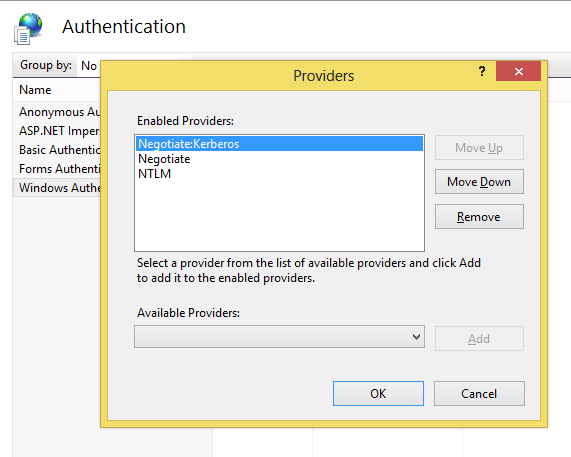 You may need to disable "Enable Kernel-mode authentication" - this is accessible by right clicking on "Windows Authentication" under the Authentication and selecting "Advanced Settings". If Delegation doesn't work initially try toggling this setting (with an IISReset). If you need iPhone/iPad access either via Safari or XLCubed Mobile, you need to add a configuration profile to enable single-sign on for the device. This can optionally include a list of application ids. When you register the website in XLCubed Mobile, enter the url and then leave "Requires Logon" off, authentication will be handled automatically. You can then email the profile to the users, they can then open and install the profile. During the installation process they need to confirm the details and enter a "realm", this would be their user-id, it can be left blank for them to be prompted for that each time. It is possible for some non-Internet Explorer browsers to use Kerberos, here are some tips that may help, but if you can't get it working then Internet Explorer would need to be the fall back or consider setting up Dual Authentication for access to remote clients. From V9.2.31, if running against Analysis Services (tabular or multi-dimensional) there are alternate configuration options that by-pass the need for Kerberos Delegation to be configured. To use this approach the server connection would be made using the Application Pool user and make use of the "EffectiveUser" connection property to impersonate the XLCubedWeb user within Analysis Services itself. The first setting ensures the application pool user is used for the data connection and the second setting forces the "EffectiveUser" to be set to the XLCubedWeb user. This page was last modified on 22 March 2019, at 13:44.